The FSW-40A and FSW-50 Series flow switches feature 15 A SPDT switches and an internal screw adjustment for in-line monitoring of switch points. Multiple drag disks provide incremental switch point adjustment. 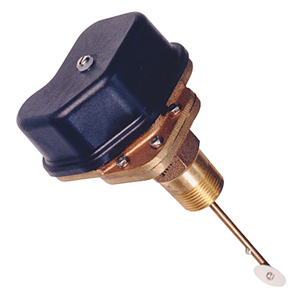 Their non-magnetic design makes these switches ideal for applications in which rust is a problem. The FSW-40A Series has a brass and stainless steel construction (optional 316 SS), while the FSW-50 Series comes in a plastic/316 SS construction. The FSW-40A Series is ideal for machine-cutting oils and for sewage applications in which large objects are not caught on the drag disks. Installation “T” fittings are recommended for installing switches for 2" pipe size and below. For other pipe sizes, a “tee” fitting or weld coupling can be used. Electrical Cable Fitting: Water resistant for cable diameters 0.250 ±0.025"